It’s no secret that Carrie Underwood has some of the best hair in the business. It’s always shiny, healthy and OMG, her voluminous curls, they’re to die for! Here are a few fab hair tools and products inspired by her that we think the country crooner would totally use. Whether she’s performing on stage in front of a huge crowd or posing pretty on the red carpet at an awards show, a great hairspray is key if you’re a busy, on the go girl like Carrie Underwood. That’s why we love Stuck Up Mega Hold Hairspray. It ensures that curls are always super soft and oh so touchable. Plus, it provides maximum hold, volume and thermal intelligence. Forget stiffness; with this stuff, you can easily comb through strands. Carrie’s definitely known for her big, bouncy blowouts. But how does she get her hair to look so gorgeous? Easy, she uses a round brush! Perfect for creating volume, the Click n Curl brush goes one step further, featuring six detachable heads that stay in your hair and essentially act as rollers. Once they cool down, all you have to do is take them out. The best news? These babies come in a few different sizes so you can get all the bounce you need. Blondes may have more fun, but maintaining bright blonde tresses can be no fun at all. Just ask Carrie! For those who dye their locks lighter like her, we highly recommend stocking up on Keratin Complex’s Blondeshell Shampoo and Conditioner for radiant hair color 24/7. Perfect for all types of blondes from natural to highlighted, this stuff prevents strands from ever getting brassy, thanks to a fade-fighting chamomile complex and strengthening blend of vitamins, keratin and botanical oils. Love it! 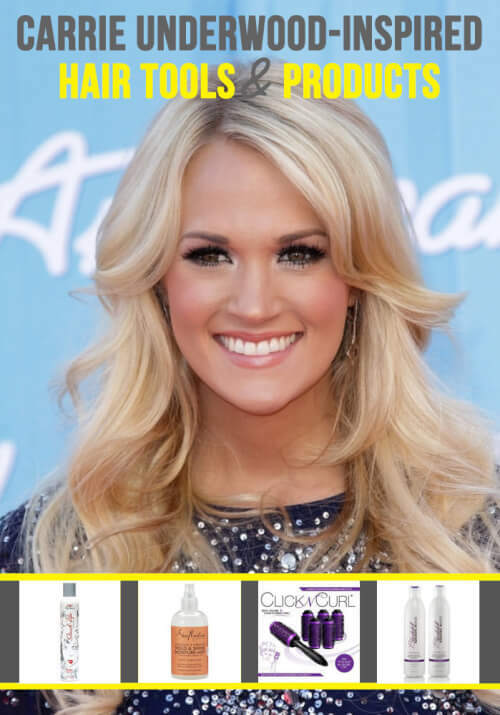 Now that you have the tools, learn how to create your favorite Carrie Underwood hairstyles here.